It’s no secret that I love food documentaries. My favorites are those that are positive and hopeful, and I try to avoid those that are really just devoted to fat shaming. I may be a health nut, but I also am a health at every size nut. 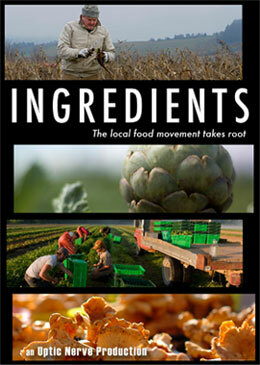 One of my favorite recent discoveries is Ingredients, which is currently available streaming on Netflix. This film is a tribute to the local food movement, and rather than focusing on how evil and awful and scary and terrible industrialized food is, the narrative centers on the stories of real food and the people who love it. I came to locavorism from a place of joy — I love food, I love farms, I love Oregon, I love small businesses, I love sustainability, I love the natural world, I love doing good, I love the rhythm of the seasons… eating local is an extension of my love. When I talk to the farmer who grew my kale, I feel happy. I’ve never understood why so many food documentaries are so dire — hope is stronger than fear. People don’t become great environmentalists because of hearing about the size of the trash continent, they become great environmentalists because they fall in love with nature. Similarly, I do not believe that we will create a society of healthy food enthusiasts through a barrage of footage of feedlots, we will do it by showing people how awesome the alternative is. Ingredients does this in a big way. The film follows the seasons, interviewing farmers, chefs, and activists from several different food communities (the Portland metro area featuring prominently, naturally!) about their philosophies and experiences. We see farmers in love with the soil, chefs striving for the perfect dish, and activists working for healthy school lunches. Real people talking about their real lives always makes for compelling film; I was genuinely interested in these stories, and I loved the frame narrative of the seasons. I also thought it was interesting to compare the experiences of people here in my part of the country with those of people living in Ohio, or New York. I’d love to see an even broader exploration of this topic — what’s the local food movement like in the Southwest? Or in Alaska? But of course what I love most is that we see food — real food. This is, after all, about ingredients, and they are allowed to take center stage. We see farmers picking artichokes, or pulling up parsnips and carefully brushing them clean. We see adorable, succulent lambs gamboling in the pasture. Wild mushrooms. Ducks. Acres of greens. Cows. Mixed-use small farms with everything you can imagine. Basically, this movie made me hungry. And I think that’s the best emotional hook to get people on board — this film will help you fall in love with local food. That issue, though, of choice and access is one that I think could be explored more deeply. Toward the end, there was some discussion of the fact that the local food movement is still largely the purview of those with economic means, and there was some good coverage of efforts to connect farmers directly with low-income people. The filmmakers also included information about how our economic policies have rewarded the growing of commodity crops at the expense of real food (and at the expense of our health, especially the health of people of lower economic means). However, I think it would still be pretty easy to dismiss this as just being a “rich white people” movie and that frustrates me. That said, I’m not certain this is a fair criticism. I think this film was aimed at people who do have the means to choose what they eat, and was urging them to get behind local food. Maybe instead of asking this film to be all things to all people what I really want is to pair this with another, perhaps more radical documentary about food activism. All in all, this is a great film. I highly recommend it, and I also suggest finding clever ways to get your friends to watch it, too. I’m envisioning informal screenings in living rooms, with locally-sourced snacks. The local food gospel is one worth spreading, and if those of us who are into it seem like zealots, well, it’s just because there’s a lot to get excited about when it comes to tasty, sustainable food that creates real economic empowerment within communities. Naughton starts right out of the gate by calling out the tactic of using endless looped video of extraordinarily fat people when talking about America’s “obesity crisis.” He points out that he himself, who just looks like a normal guy, is technically obese, and really lays out a wonderful case that pretty much everything the media tries to sell us about the idea of obesity is total bologna. Clearly this is a message I’m already on board with (and one I encourage other people to really learn more about — one great place to start is the blog Junk Food Science) but I was genuinely shocked to see a wellness and food documentary that focused on this instead of jumping immediately to FATNESS = DEAAAAATH!!!1! In particular, Fat Head is one of the first films I’ve seen that says so clearly something I’ve said for years: fatness is a symptom. The same factors that lead to poor health outcomes also lead to fatness, and treating the fatness without treating the underlying cause is severely misguided. This film perfectly skewers much of what made Super Size Me so insufferable — the lack of scientific rigor, the contradictions, the paternalism (“poor people are too stupid to defend themselves against the evils of corporate food giants!”), the layers of fatphobia, the oversimplification, the vegan agenda, and more. I really hated Super Size Me on a lot of levels, so it’s not surprising that I would enjoy this cunning evisceration of it. One of the major points of the movie is something that I think never gets enough air time: the single biggest difference between people now and people historically, even just a few decades ago, is the amount of physical activity inherent in our daily lives. I have some fruity notions about diet, but I still think that exercise is the real key both to weight loss and to overall health. The biggest awesomeness of all: slowly, subtly, this film shifts from being a simple story of losing weight while eating burgers to being a thorough examination of the science behind… a high fat, low carbohydrate, grain-free diet. Yep, Fat Head is a paleo movie, and it’s AMAZING. This film brilliantly deconstructs the lipid hypothesis, the USDA food pyramid, and other cornerstones of “conventional wisdom,” exposing the shocking lack of scientific rigor behind all of the dietary “truths” we’ve been told over the years. Naughton’s simple, engaging style is extraordinarily informative while being relatable and even entertaining. I consider myself a pretty smart science nerd, and very well-informed about dietary research, and even though this was all preaching to the choir for me I came away from watching feeling like I have a much better understanding of metabolic syndrome. After the conclusion of his fast food experiment, Naughton decides to go on a diet of meat, vegetables, and loads of fat for a month — he loses weight and his health markers (cholesterol, etc.) improve. Naughton has now become an outspoken advocate for essentially a paleo diet. He has a blog. It’s a good read. I need a cute system to summarize my movie reviews, like “I give this film four pigs!” but that’s now how my brain works. The best I can do to recap is watch this movie if you possibly can.